"This time our first goal was to make contact with young people in each parish to find accommodations for the participants in the meeting. Thanks to some young people who explained things well, people are open and our agenda was quickly filled with appointments and meetings with youth groups in the parishes." Meanwhile, the search for professional partners to provide various logistic needs for the meeting has continued, as well as contacts with the authorities. A few visits to rural areas to invite young people have enable us to discover another face of the country, to measure its roots in tradition and the difficulty for young people to find employment. "In my parish a lot of young people go to Nigeria, the young men work in construction, the young women as domestic workers. They come back for Christmas. The uprooting is radical!" 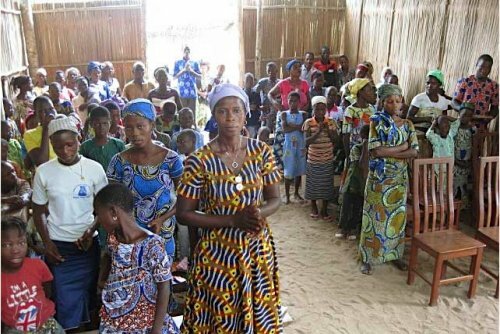 confides Father Adelphe, pastor of Sedje-Denou, two hours from Cotonou. Youth and their parents are carrying this pilgrimage in their prayer, so that young people will set out to cross borders, families to open their hearts and their homes to offer hospitality, local communities to mobilize in order to share the hope experienced by so many of their members. Themes for the preparation can be reflected on every month and nourish reflection and sharing. The songs for the meeting can be put on the program of the rehearsals for many choirs that support liturgies. The establishment of local committees (welcome, accommodation, preparing the prayers, animating the mornings and looking for signs of hope, coordinating the transport) will continue over the coming months. An appointment has been made for the month of March to assess the progress of work and to keep going forward together.